The Nike iPod shoes are the best thing in footwear these days. I can’t think of a shoe that is more high-tech than the Nike + iPod workout kit. 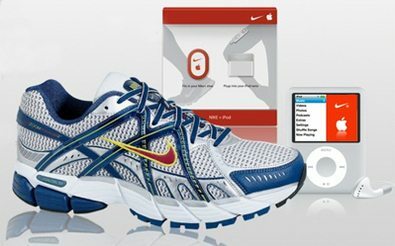 All you have to do to have the best of all worlds is to get yourself a Apple iPod nano ($199), a pair of Nike+ shoes ($135), and a Nike + iPod Sport Kit ($30). From there, your shoes and your iPod will begin to communicate with one another. You can watch the time, track your miles, and listen to songs — all while receiving real-time feedback about your run. The interesting part… even gyms are starting to incorporate Nike + features into their workout facilities! Check out the Nike + Running App to see it in action and track your own running stats. Here’s a video review showing how the Nike + iPod sport kit really works.